September 1, 2018 at 12:00 am. The culture of our nation is much different than it was two decades ago. And because of those differences, the church has been challenged to meet the perceived and real needs of this generation. Many young families are leaving the traditional churches they were raised in, setting aside their denominational loyalties and traditions, while they search for a “purpose” to attend church. With their departure, it’s just a matter of time until a once-thriving church can no longer support the financial needs of ministry. While many churches are struggling, others are making the transition to meet those needs and provide purpose, or reasons, for those families to attend. In what position do you find your church? Struggling and in need of transition? If so, what can you do to fight back and become relevant again? The mass exodus of members from smaller churches has been happening for the last decade and a half, but is now changing at an exponential rate. To some, this message is unsettling: If your church doesn’t adapt — now — it probably won’t be here in in the near future. As the culture changes, our methods need to change to communicate the same basic message. The gospel message is the most important thing we have to offer for a lost world; but if you can’t get people to come in the building, there’s little value in the message. Too many churches aren’t willing to make the needed changes. Ministry facilities are often what make (or break) the first impression of your church. We offer five main areas of focus that can help your church communicate that you desire to meet this generation’s needs. #1: Create curb appeal: The most basic and inexpensive thing to do is to make sure your building is clean and well-maintained. Nothing you do will be good enough if your paint is peeling and your grass isn’t mowed. There are things that can be done to add to the curb appeal, even to a dated building, to help communicate you’re in transition. #2: Gathering space: Make sure you have plenty of space to connect. Churches today aren’t designed for the way they “look”; rather, they’re designed for how they “feel.” This is a relational generation that desires to be intimately connected to other people. We were created for fellowship and relationships. Does your space feel like a place where people can connect, hang out, and feel comfortable? Download the full eBook here! #3: Children’s space: It depends on your situation, but this should usually be the highest item on the priority list. 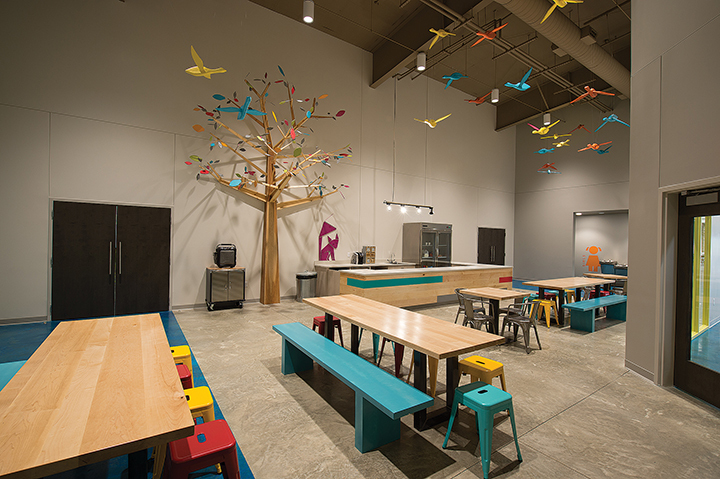 Children’s spaces must be clean, child-friendly — well-themed, with good security. Today’s parents highly value these points and aren’t likely to return if these needs aren’t met. Two decades ago, the emphasis was reaching adults who would bring their children. Today, churches that focus on meeting the needs of families with children create opportunity to reach adults, because their children want to attend. #4: Platform: The platform or stage communicates a lot about who you are as a church. You must create a warm, inviting space where people feel like they’re involved with, and connected to, the entire worship experience. 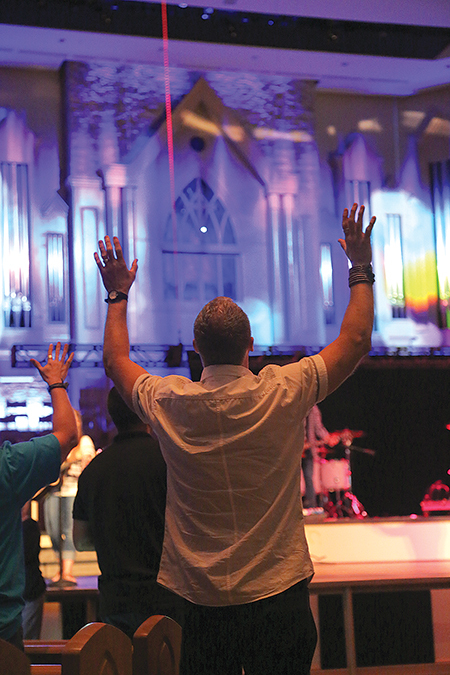 The lighting, décor, and visual technology must be up-to-date and engage the congregation. #5: Restrooms: This is the last place churches want to spend money, but it can be one area where your church is most harshly judged. Redecorate with new countertops, flooring, and maybe new toilet partitions. Often, you’ll need to update to ADA standards. As wrong as it seems, the bathrooms need to be just as warm and inviting as the worship space. We get it. This is tough stuff. Our team has walked hundreds of pastors through these transitions, and we understand the challenges (both financial and ministerial) with making these changes. When we grew up, we went to church based on principle. We went to church because we were committed to that church. We grew up at that church, and our parents, maybe even grandparents, were still in that church. Today’s culture seeks a church based on purpose. What need can your ministry fulfill in my life, my marriage, my family? 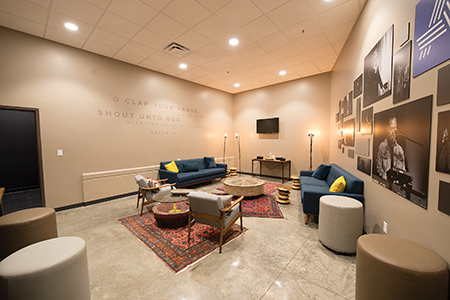 The challenge is to create a facility that helps your ministry meet the needs of our culture and that drives people into our facilities, communicating that there’s a purpose — and that the church understands their needs. We understand that this can be uncomfortable to some. Some feel that if we introduce contemporary music, lighting and video technology, or a coffee shop, we’re sacrificing our heritage. The fact is, our methods might change, but our message does not. Our facilities are part of that message. The definition of the word “facility” is ‘unimpeded process.’ If we’re going to facilitate ministry, we can’t have our buildings acting as obstacles to the message we communicate. Rodney James served as executive pastor, then senior pastor, at Sequoyah Hills Baptist Church in Tulsa, Okla., for 20 years. In that time, he led and completed multiple building and renovation projects. In 2012, James joined Churches by Daniels, Inc. in Broken Arrow, Okla., as Director of Business and Finance. He is now a Business Partner and Vice President of Business and Design. 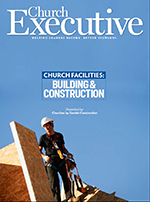 The company specializes in designing and building churches nationwide.